"A mildly hot, and very delicious, Mexican sausage. Excellent for breakfast, lunch, or dinner. Can be made into patties and cooked in a skillet, or stuffed into natural hog or collagen casings and grilled at your next family gathering." Place the pork, Aleppo pepper, chili powder, garlic, salt, black pepper, oregano, cumin, cloves, and coriander into a bowl, and lightly toss the pork with the seasonings until thoroughly blended. Cover the bowl, and refrigerate the meat, your meat grinder's head assembly, and grinder hopper for 1 hour. It is very important to keep the meat very cold throughout the grinding process. Do not reduce refrigeration time. This recipe will yield a mildly hot Mexican chorizo designed to suit most people. 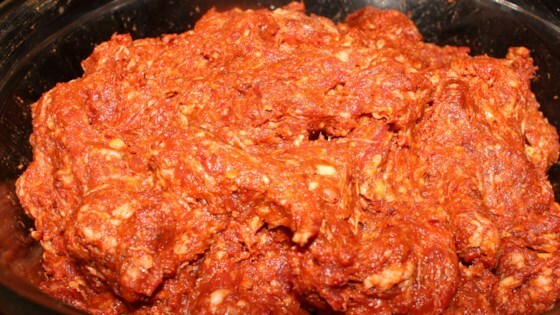 For a spicier chorizo, add 5-15 crushed pequin chilies, depending on desired heat level. Aleppo peppers come from Syria and have a fruity, medium spiciness. Find them at specialty spice shops or Middle Eastern grocery stores. Used ground pork, as I am not enamoured of my new meat grinder. Sub 1 tbs. paprika and 1/2 tsp. cayenne for Aleppo. This is the real deal. I added a 1 teaspoon of liquid smoke. Where do I find Aleppo pepper?